I picked up this bottle of Rayon Vert, a recently (re-) released Belgian-Style Pale Ale from Green Flash with low expectations. 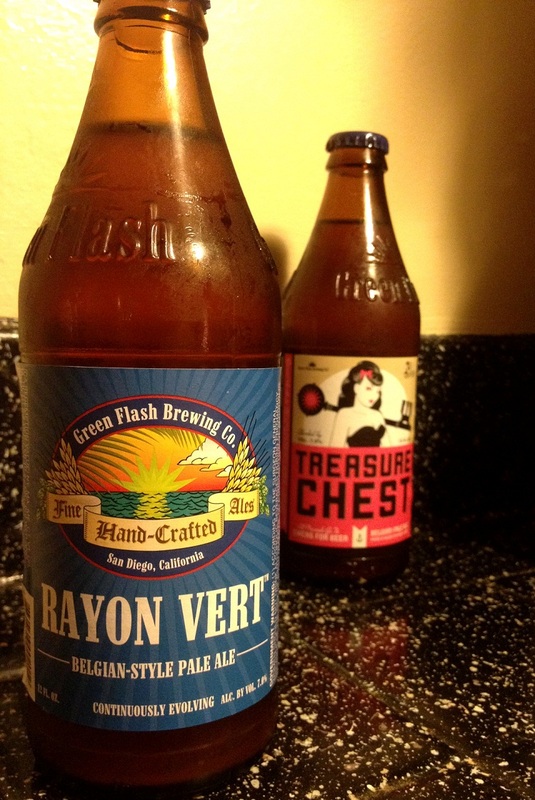 Green Flash released a small amount of a beer called Treasure Chest in June of this year, which was a test run of sorts for Rayon Vert, Brewmaster Chuck Silva told me there were some minor recipe changes but they’re pretty similar. Unfortunately I didn’t like Treasure Chest too much. Everytime I opened a bottle I smelled and tasted band-aids. This was most likely a result of the Brettanomyces used to bottle condition the beer. After pouring carefully into a glass (while being careful not to disturb the yeast at the bottom of the bottle) I took a whiff and was immediately reminded of plastic-smelling band-aids. Because it is bottle conditioned, the beer will continue to change with age and there is no way to foresee what it will taste like after years in the bottle. Silva predicts that the results from this ageing process will be akin to Champagne. 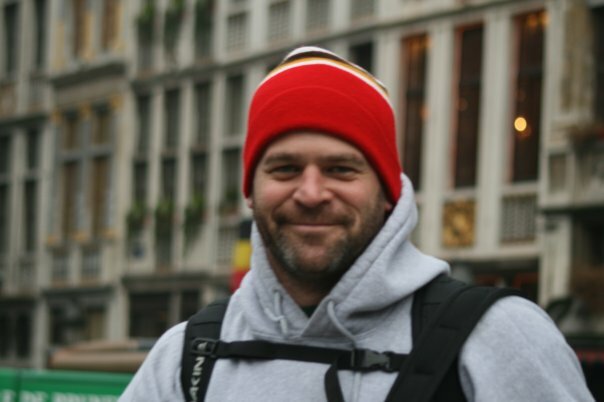 He is convinced that Rayon Vert left to rest in the proper conditions will only improve over time. Rayon Vert is a solid beer when fresh, hopefully it ages gracefully. 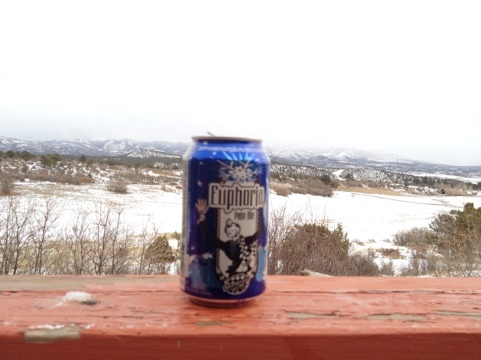 Euphoria (Ska Brewing’s Winter seasonal) might be the perfect word to describe things right now: quality craft beer in a can, just enough snow to set the mood for a white Christmas (but not enough to require the driveway to be shoveled) and a bald eagle perched up in the tree. Unfortunately Ska’s beers aren’t available in California, but that makes vacations all the better. 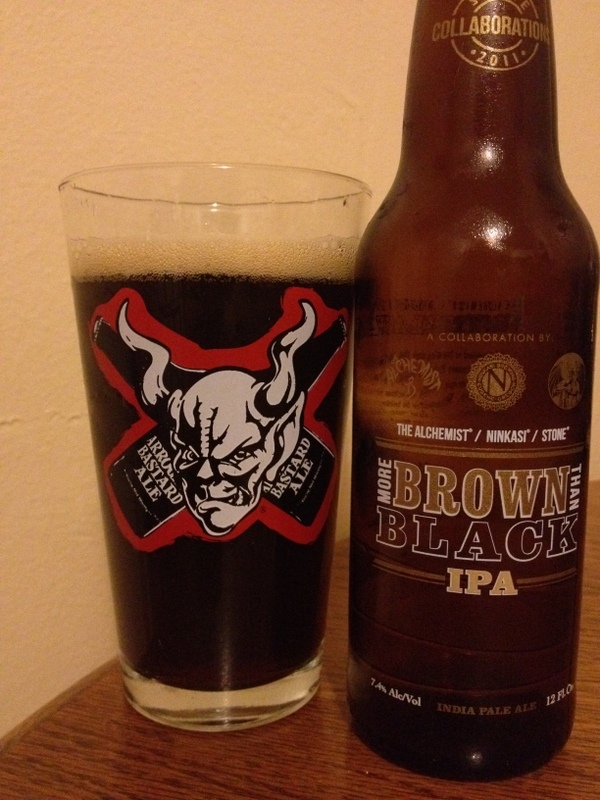 Posted by Jeff Hammett in beer reviews, breweries, san diego brewed, stone brewing co. The Alchemist / Ninkasi / Stone More Brown Than Black IPA is Stone Brewing Co.’s latest collaboration, and to me at least, it sort of flew under the radar until recently. I had heard about it a few months ago, then forgot all about it until a promotional sample from Stone showed up late last week. Not knowing much about it until recently I had no idea that proceeds from sales will go to the Waterbury Good Neighbor Fund, a non-profit aiding families affected by Hurricane Irene. Hurricane Irene you might remember did massive destruction in Vermont (and other parts of the East Coast). The Alchemist brewery, which I wasn’t too familiar with until the hurricane is based in Vermont. Black IPAs aren’t my favorite style, but I’m starting to get used to them. No longer do I get startled by a deliciously hoppy smelling black beer. The same can’t be said about brown beers. Pouring The Alchemist / Ninkasi / Stone More Brown Than Black IPA it looked like any other brown ale. But upon first whiff it was obvious this was no regular brown ale. Maybe it was the huge disconnect between what I expected based on the color and what my senses detected, but this was one of the best smelling beers I’ve come across. Huge piney hops. When people call a beer “dank” this is what they mean. The taste is mostly hops as well, just like the smell lets on, huge piney hops, some citrusy orange/grapefruit hops. The hops really shine here, there isn’t a ton of malt, though a bit of roasted malt and maybe a hint of chocolate malt come through, the roast is far more subdued than many Black IPAs. I’ll admit, I hope the “Brown IPA style” doesn’t catch on, but this one is another solid collaboration from Stone. 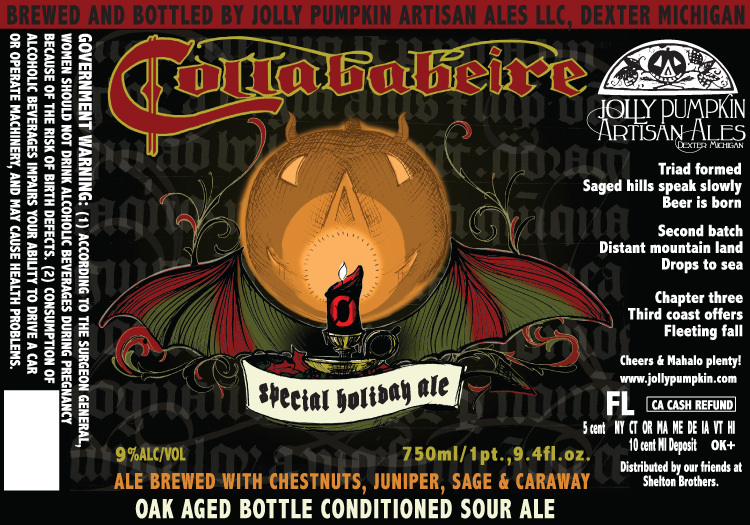 I’ll certainly be picking up a few more bottles of this before it’s hoppy time runs out. 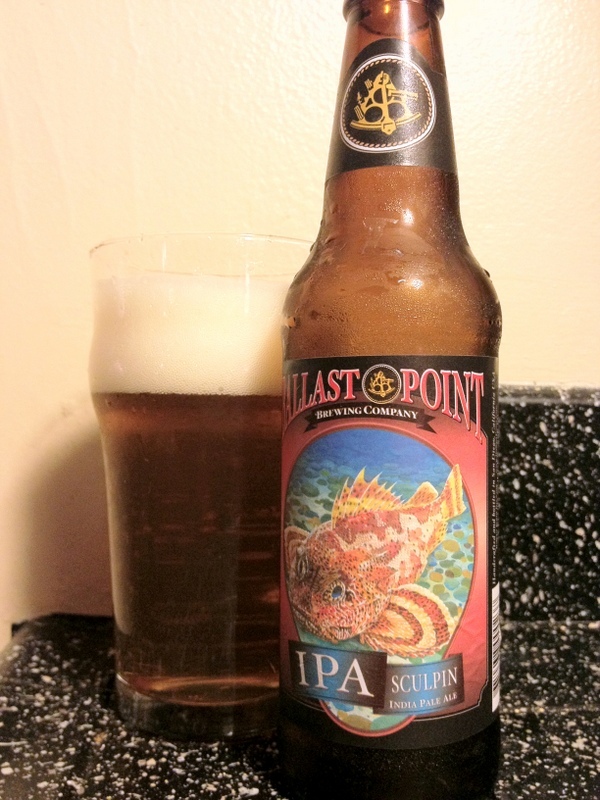 Ballast Point Brewing Co.’s Sculpin IPA is a beer that I assume most people reading this blog know fairly well. At 7% ABV it’s right on the IPA/DIPA brink. It’s 70 IBU with a pretty light body and low malt profile which makes the hops really stand out. Sculpin took the gold medal at the 2010 World Beer Cup in the IPA category, and it’s not hard to understand why. The hops jump out at you in both the smell and taste. 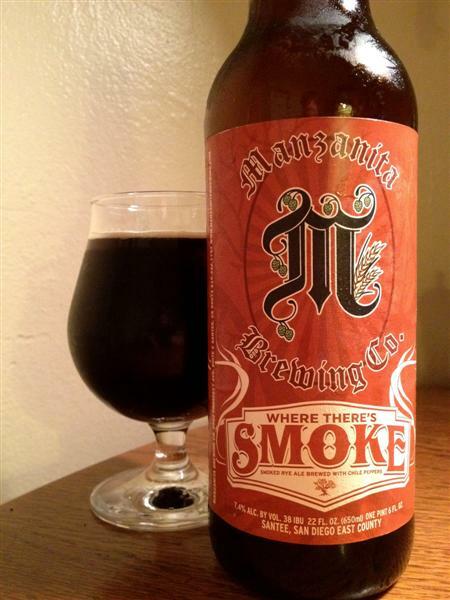 It’s hugely fruity and juicy with smells and flavors reminiscent of all sorts of fruits: mango, peach, and apricot. I don’t get a ton of citrus flavors from it, but some people do. It’s not overly bitter, there’s plenty of hops but they showcase flavor over bitterness. This is a beer that folks all over the country (and world) seek out, but we’re lucky enough to be able to get it year round with ease. Get a growler filled at the source (Ballast Point has two brewery locations with tasting bars/growler fills in San Diego) for the freshest possible taste. 22oz bombers typically cost between $7-8 while six packs of 12oz bottles go for around $15. I picked this 12oz bottle up at Bottlecraft for $2.50 (broken down from a six pack). 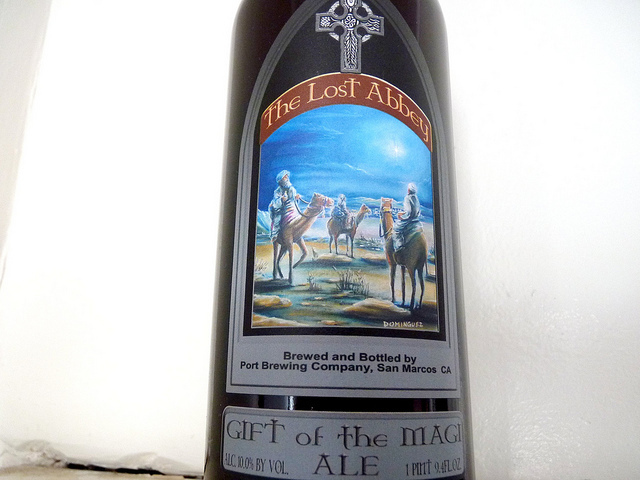 Gift of the Magi, the Christmas seasonal from The Lost Abbey is a beer I pick up a bottle of every year around this time of year. As a beer it doesn’t blow me away, and I usually only have it once or twice a year, but there’s something about it that causes me to pick it up each year. I don’t think The Lost Abbey ever defines the beer style (they refer to it as a “Golden Ale”) but general consensus (at least on Ratebeer and Beeradvocate) seems to be that it’s a Bière de Garde. At 9.5% Gift of the Magi makes a nice Winter beer even though the style isn’t the first thing I think of having this time of year. A dark reddish brown (I wouldn’t call it Golden in color) with a small white head, an earthy smell is the first thing that stands out. I’m pretty sure there’s Brett in there, but this beer is pretty fresh so it doesn’t stand out much. I’ve heard great things about 2-3 year old Gift of the Magi, but never aged a bottle myself (note to self: pick up another bottle). There’s also a slightly sweet, berry-like smell in addition to the earthiness. It’s pretty bitter, I’m not familiar with Frankincense so I can’t pinpoint that specifically, but it is an earthy bitterness. There’s some toasty grain sweetness and a strong alcohol kick at the end of each sip. There’s no denying this beer is close to ten percent alcohol, making it a sipper. There’s a long bitter after taste which is somewhat plastic-tasting. I expected more spice but just didn’t find it. Gift of the Magi isn’t my favorite beer, but isn’t a bad beer. I think I’ll put one away for a year or two to see how it changes.